My kids love quirky books. And it appears what they love most is quirky books about reptiles. If you read this post, you know about the “dragon” books my son loves. We’ve added two more to our list this week. Last week’s library trip was extra special because Daddy got to go with us. He stumbled upon a book he loved from his childhood, The Mysterious Tadpole, and we have read it daily since then. Steve Kellogg is just so fun. His characters’ expressions and development is amazingly thorough in just a short book. I also appreciate the details in his drawings that seem to be especially for adults to pick up on (like the furniture store sign that says, “Park here! (Please) (Please) (Please ),” or the “Huff and Puff Construction Company”). 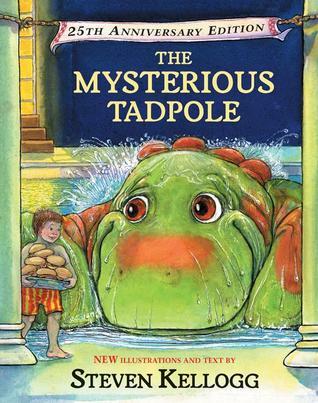 The Mysterious Tadpole is a zany story about Louis’s birthday present, the tadpole. The tadpole turns into a rather peculiar kind of frog, and quite an adventure comes with it. We also love Kellogg’s books about Jimmy’s Boa; The Day Jimmy’s Boa Ate The Wash is our favorite. (I’m telling you, we read way to many reptile books). 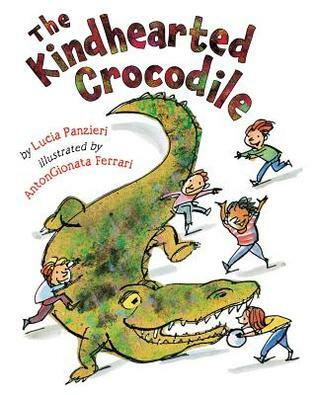 The sweet crocodile in this book only wants to be loved, so he goes above and beyond his calling as a picture book illustration to squeeze his way into the hearts of the family who owns his book. Who is picking up the toys? The dishes should be dirty! I might be okay with almost any kind of pet who does my dishes while I sleep. I love that the real kicker is when he brings the parents a really great cup of coffee. “Okay, you can stay!” Coffee is like a love language to some people. So that’s the fun stuff we’ve been reading lately. I’m making a list of some educational books to balance out all the whimsy for our next library trip. I’m thinking a detective-themed book would be fun, too. Any suggestions? Your input is always welcome!